Due to operational simplicity and a very good interoperability with all modern operating systems, Network Attached Storage (NAS) devices are becoming more and more popular in home networks and enterprise data centers. A wide availability of low cost, off-the-shelf servers and high-capacity disks making it very simple and cost-effective to use DIY NAS devices based on commodity hardware and powered by a modern operating system with a built-in NAS server. 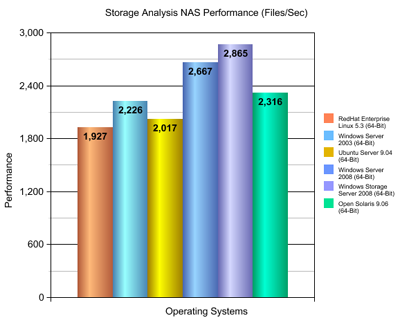 The purpose of the benchmark is to compare the performance of NAS software bundled with server operating systems on an identical hardware platform using a highly diversified set of file read, write, search, analysis and delete operations. For the NAS benchmark we have selected a wide range of server operating systems including: Windows Server 2003, Windows Server 2008, Windows Storage Server 2008, RedHat Enterprise Linux v5.3, Ubuntu Server 9.04 and Open Solaris 2009.06. All operating systems (64-Bit versions) were tested on the same hardware platform equipped with an Intel Q9650 Quad-Core CPU, 4GB of system memory, Intel Gigabit Ethernet NIC, 10K RPM WD Raptor system disk and four 500GB WD RE data disks. Each operating system was installed using default configuration options and no performance optimizations were made after the initial OS installation. The NAS server was tested through the network (3Com Gigabit Switch) using four identical client machines equipped with an Intel E8400 Dual-Core CPU, Intel Gigabit Ethernet NIC, 2GB of system memory and running the Windows XP SP3 (32-Bit) operating system. All tests were performed using the DiskBoss File and Disk Manager with an identical 8.4 GB data set containing about 88,000 small, medium-sized and large files. After each test, the NAS server and all client computers were rebooted. For each operating system, we have performed file copy (bi-directional), file synchronization (bi-directional), file search, file classification, storage analysis, duplicate files detection and file delete operation using 1, 2 and 4 client machines simultaneously. Multi-stream test results were averaged for each specific operation, normalized and finally combined into an average NAS performance graph. 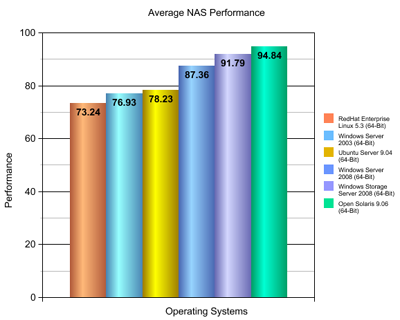 According to the average NAS performance graph, Open Solaris 2009.06 leads the pack providing the most balanced performance results in all types of operations. Windows Storage Server 2008 and Windows Server 2008 are coming on the second and the third place respectively, mainly due to a significantly slower file write performance. 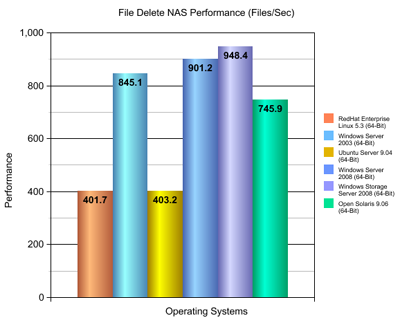 Ubuntu Server 9.04 comes on the fourth place with a good file write performance, but significantly degraded file search, classification, analysis and file delete performance. 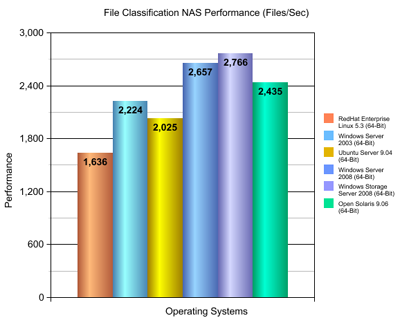 Server 2003 comes on the fifth place mainly due to poor file write performance and an average search, analysis and file classification performance. Finally, RedHat Enterprise Linux takes the last place due to poor file read, file search, classification, analysis and file delete performance. The performance benchmark revealed a number of clear trends. First of all, Windows-based servers are tend to be significantly slower on file write operations, somehow faster on file read and analysis operations and significantly faster on file delete operations. Linux-based servers provide a good file write performance, but suffer from a significantly slower file read, search and analysis performance. 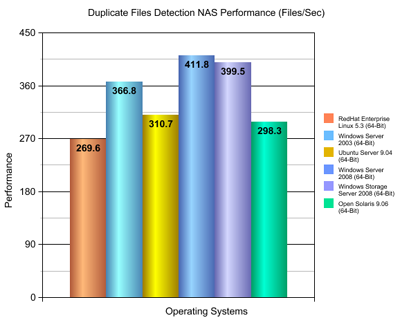 In addition, Linux-based servers suffer from a very poor file delete performance. Finally, Open Solaris 2009.06 provides an exceptional file write performance, a good file read performance, an above average file search, classification and analysis performance and an above average file delete performance. An operating system for your NAS server should be selected according to your own file access patterns. If you are expecting to perform lots of file write operations, use a Linux-based OS or Open Solaris. If you need more performance for file read operations, use a Windows-based server OS. Finally, if your need a NAS device with a balanced performance for all types of operations use Open Solaris.